In the world of emergency medicine, there’s nothing fun about the guessing game. With a seriously ill or injured patient, every second counts and the wrong diagnosis can actually have a significant impact on health. That’s why having all available information is absolutely critical to stabilising patients and saving lives. That’s also what makes point-of-care ultrasound so critically important in emergency care. 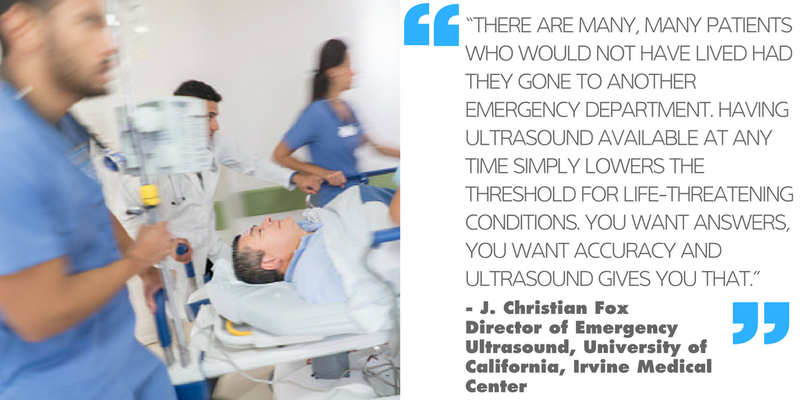 “[Ultrasound] allows us to determine the best course of action immediately, rather than making our initial decisions blindly and confirming later if we were right or wrong,” says Dr. Alberto Ángel Oviedo García, an emergency medicine specialist in Seville, Spain. Having as many answers as possible allows physicians to make the crucial, life-saving decisions in a timely manner. Dr. Oviedo, who practises at Hospital de Valme, is an educational evangelist for point-of-care ultrasound, and has worked to spread ultrasound education to colleagues both in and outside of emergency care. Read more about Dr. Oviedo's ultrasound work in Health Management online.